World No. 3 Dustin Johnson created a career double first in capturing the inaugural Saudi International on Sunday. Johnson birdied his closing two holes in a final round 69 to win by two shots with a 19-under par tally on the host Royal Greens course laid out along the Red Sea. China’s in-form Li Haotong was runner-up in producing a fighting final round 67 to finish the week on 17 under par. 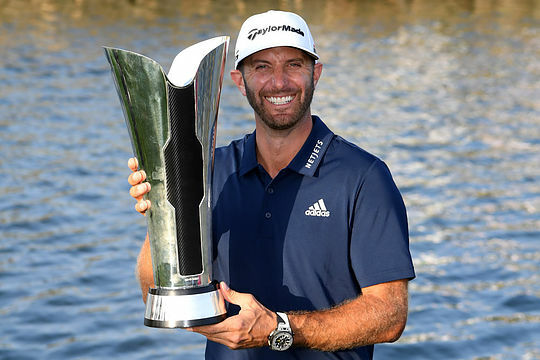 Not only has Johnson etched his name into golf’s history books becoming the first to win in Saudi Arabia but it is also Johnson’s first regular European Tour victory and only his second career success outside of North America after capturing the 2013 WGC – HSBC Champions event in China. The win is also the 21st win of Johnson’s pro career and makes him the USA’s fifth most successful player on the European Tour behind Tiger Woods (40 wins), Phil Mickelson (10), Jack Nicklaus (9) and Tom Watson (8). Johnson was heading straight to the US West Coast where he will tee-up in Thursday’s start to the AT&T Pebble Beach Pro-Am – an event he captured in 2009 and successfully defended a year later. Australia’s Min Woo Lee recorded a superb outright 4th placing in just his second start as a professional. The Western Australian fired back-to-back 63′s across the weekend to take home a cheque for €152,479 (A$240,000) and now sits at 28th on the Race To Dubai leaderboard. “I didn’t know what to expect today. I just knew that I had to keep my head in the game, really, and hit every shot really fully committed. I’m happy that I did and I’m glad with the score. I know those guys are superstars, so I just said, play my own game…as a second start as a pro, I’m very happy,” said Lee. Sam Brazel and Wade Ormsby missed the cut. Could Oakmont finally witness Johnson’s first major?